It would be great to have a large Boulder presence at the Jewish Community Relations Council Luncheon on Thursday, May 17th, from 11:00 to 1:00 (program starts at 11::30) at Temple Emanuel, 51 Grape Street, in Denver. 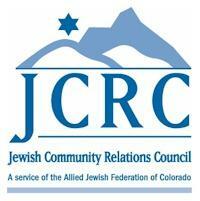 The JCRC advocates for domestic and international policy issues that affect the Colorado Jewish community, represents these views to the Jewish community and to the general community of Colorado, and organizes the Jewish community in times of crisis. The Boulder JCC, Boulder Chapter of Hadassah, and Congregation Bonai Shalom are included in the 37 member organizations. This year, the JCRC is honoring Howard and Carol Boigon for their leadership contributions to the Colorado Jewish Community. The Honorable Carol Boigon is a trailblazer for policies affecting children, families and education here in Colorado. A long-time public official, Carol has often been an important voice of the Jewish community and instrumental in educating others about the Jewish perspective on the issues. Howard Boigon, an attorney, is the immediate past chair of the Colorado chapter of the American Israel Public Affairs Committee (“AIPAC”), and is a member of AIPAC’s National Council. He has served on the Israel/ National/Overseas Board of Federation. He also volunteers in many other ways in the Jewish community and also in the public schools. The cost to attend the luncheon is $50 per person. For more information or to make a reservation, please contact the events department at events@ajfcolorado.org or 303.316.6466. Reservations may also be made online at www.jewishcolorado.org/jcrcluncheon.